There are a number of passive abilities a card may carry in the form of keywords. These are important to remember, and can often be combined with each other to make very effective, simple strategies that carry over to higher levels of play. A player facing a creature with taunt cannot attack anything else until that minion has been removed. This only applies to attacks, however, not spells. A simple strategy for dealing with taunted minions is to remove them with spells first, assuming you want to attack something else this turn. Minions with taunt can attack just like any other creature. A minion with a battlecry will resolve its card text as soon as it's played on the field. This keyword is specific to minions. Brewmaster minions are useful to have in almost any deck because of their battlecry, which returns an allied minion to your hand. This can be used to return and summon damaged minions for full health, or to get a double-shot of another minion's battlecry. Vanish, a rogue-specific spell, has the same effect as a Brewmaster, but does so for every minion on the field. Silence is a negative keyword usually imparted as part of another creature's battlecry. A minion that has been silenced loses all of its special abilities, including those imparted by spells and not part of the minion's normal text. One simple use of silence is to use it on minions with taunt. This will remove the taunt ability, and allow you to attack any target you want (assuming the opponent doesn't have more than one taunt creature). When a minion has divine shield, it will ignore the first instance of damage done to it. This counts both against attacks from heroes and other minions, as well as spells that do damage. A couple of easy ways to get around divine shield are to burn a weak spell that does little damage (e.g. Moonfire), or to attack with minions that only do one damage (though the former is preferable). A great combo to use with divine shield is giving it to one minion with taunt. This will either force the opponent to attack the shielded creature two or more times to kill it -- damaging or killing its own units in the process -- or wasting powerful removal spells on relatively weak creatures. For the record, divine shield does not protect from removal spells that don't deal damage directly, like Execute and Assassinate. Windfury allows a minion to attack twice in a single turn. Windfury can almost be used as a substitute for taunt, as it makes a unit a prime target. Your opponent won't want to let a minion with such a powerful attack survive for long. If you want to make sure your windfury unit survives long enough to attack, it's best to play them when there is an actual minion with taunt on the field to curb enemy aggression. If you have a choice, it's also best to play temporary attack buffs on minions with windfury. This effectively doubles the temporary boost. Combo works just like a battlecry, except that you must play any other card first for the combo to activate. Unlike battlecry, this keyword is also specific to the Rogue class. Just like battlecry cards, combos work well with Brewmaster minions by allowing you to resolve the effect multiple times -- sometimes even in a single turn. The overload keyword is always followed by a number. That number represents how many mana crystals you will be unable to use next turn. This keyword is specific to Shamans. There are no direct benefits to playing a card with overload, except that cards with this keyword usually have very low initial mana costs for their power. The one useful synergy for this keyword is playing such cards on the same turn as an Unbound Elemental. These minions actually get stronger for every overload card you play, so it's best to use as many as possible on the same turn. Units that get stronger over time are juicy targets for enemy players, so buffing it as much as possible before your next turn will increase the resources the other player needs to remove it in a single turn -- if they can at all. This keyword (or phrase, in this case) is specific to Druids. Cards with this ability can resolve one of two abilities chosen by the player. Some cards have unique abilities not tied to a keyword. Usually, these are straightforward spells, but some can be used at special times for maximum efficiency. Much of Hearthstone is math. It's about getting the maximum gain for the lowest cost in the shortest time. As a card game, much of Hearthstone is about the literal luck of the draw. However, building an effective deck maximizes your chances of drawing the right card for the right situation. Here are a couple of tips to help you get a simple constructed deck off the ground and ready for action. A lot of players will tell you that the best deck has an even spread of cards across most mana costs. They're not wrong, but they're not entirely right, either. You want to have enough low-to-mid-tier cards to keep you from getting knocked out in the first five turns. You also want to have at least a few high-cost heavy-hitters to seal the deal in the late game. However, high-cost doesn't mean high-efficiency, and erring on the side of useful, low-cost cards can be more effective in the long run. It's not like you suddenly can't play your two-mana Novice Engineer on turn eight because it doesn't have flashy powers and high damage output. That cheap little card still gives you (albeit minimal) board presence, along with a free card draw to increase the chances of pulling a big, beefy minion. Or maybe you'll draw a Flamestrike to wipe out your enemy's board, and suddenly that Novice Engineer is the last card standing. Most cards are only as good as the other cards around them. Mages might not have great class-specific minions, but Archmage and Ogre Magi will beef up their spell damage while being solid creatures in their own right. Don't just throw cards in your deck because they're powerful. By ensuring your cards work well together, you not only increase deck efficiency, you also keep your opponent guessing as to whether they should blow their best stuff now or save it for later. Every class starts off with a set of basic cards. Every time you level up your hero by playing, you work closer toward earning pairs of new cards. This occurs every two levels until you reach level 10, at which point leveling up only serves to earn "golden" cards - fancier, flashier versions of cards you already own. Every time you get a new card, either by leveling or through booster packs, you should check if it fits your current deck strategy better than one of your existing cards. Swapping out a less interesting, less useful neutral minion for a class-specific one can be a huge boost to any deck. Don't let your heroes grow stagnant! Your opponents sure won't. Hearthstone runs on two currencies: gold and dust. Thankfully, you don't have to pay real money for either one. In fact, there's no way to directly spend real money on either one. Gold is what makes the world go round. This is what's used to purchase five-card booster packs, and more importantly, entry into The Arena. The most common way to earn gold is by winning three online matches in any mode, but completing a daily quest and opening Arena prizes (more on that in the next section) can earn much, much more. Dust is more specialized. Just like in World of Warcraft, you earn it chiefly by sacrificing your own items -- in this case, cards. Then you can use what you've earned to craft most of the cards in the game (though not all). 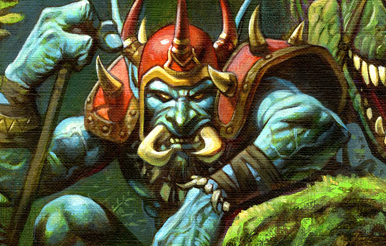 For now, there is no trading or secondary market in Hearthstone. There's no reason to hang onto more than two copies of a card, making triples (constructed decks can hold no more than two copies of a card) an easy target for disenchantment. Dust is also a common reward in The Arena. Where you spend your money is just as important as how you earn it. Don't waste your gold on boosters; take a chance on The Arena instead. The Arena pits you against like-minded players with specially drafted decks. Instead of bringing in your own decks, you must pick between three randomly selected heroes and construct a new deck from 90 semi-random cards. That means every player in The Arena is on equal footing (assuming they all made smart choices). An Arena run ends when you reach either nine wins or three losses. But no matter how many times you win or lose, you always get some kind of reward, including a booster pack, gold, dust or single cards. The more you win, the better the rewards, and you only need to reach four-to-six wins to make back what you put in. Building up dust is simple -- disenchant your surplus and unwanted cards and hope you get some from The Arena. Making gold isn't complicated either, but there are some easy ways to maximize your earning potential. By far the quickest, cheapest way to earn gold is by completing daily quests. The rewards for these usually range from 40 to 60 gold (for context, single booster costs 100 gold), though it varies. You can only have three daily quests in your queue at once, and you only unlock new ones by logging in and playing. You should try to complete at least one of your daily quests per day so that you never reach your upper limit. There are also "invisible" quests, or achievements, which earn anywhere from 100 to 300 gold, as well as special cards and prizes. There aren't many, but completing them can be worth it for the extra boost. Most are awarded for reaching some milestone, and you can see a full list in this table. Whether you're trying to complete a quest or earn an achievement, you should always be playing online. Ten gold for every three wins doesn't seem like much, but it adds up. Playing against the game's AI, meanwhile, racks up nothing at all. One of the first mistakes new players make is playing offline to rack up basic cards for each class. Playing against a real, human player can seem intimidating at first, but it's the best way to earn new cards and the gold needed to purchase things in the game. Playing online earns more experience playing against bots. Besides that, you never know, you might win a few games even without higher level cards. There's no reason to be afraid of losing because there's nothing to lose. There are zero penalties for playing in the Casual multiplayer matches. If you have the gold for it, however, the most efficient way to earn is playing in The Arena. Arena matches count towards daily quests, the three-win milestone, achievements and earn prizes on their own. The barrier to entry is a bit steep, but once you've got the hang of it, you'll be making money faster than you can spend it. You now have the basics of how to play Hearthstone. There's plenty more to discover in the form of class-specific abilities and strategies, the best ways to build an Arena deck, and so on, but this should set you on your way.